You have seen my picture a thousand times. It’s a picture that made the world gasp—a picture that defined my life. I am nine years old, running along a puddled roadway in front of an expressionless soldier, arms outstretched, naked, shrieking in pain and fear, the dark contour of a napalm cloud billowing in the distance. My own people, the South Vietnamese, had been bombing trade routes used by the Viet Cong rebels. I had not been targeted, of course. I had simply been in the wrong place at the wrong time. Those bombs have brought me immeasurable pain. Even now, some 40 years later, I am still receiving treatment for burns that cover my arms, back, and neck. The emotional and spiritual pain was even harder to endure. And yet, looking back at the past five decades, I realize that those same bombs that brought so much suffering also brought great healing. Those bombs led me to Christ. As a child, I was raised in the religion of Cao Dai (pronounced cow-die). My grandparents were important leaders within the religion, and they enjoyed respect from our entire community. Following in their footsteps, my parents, who had grown up knowing no religion except Cao Dai, also devoted themselves to its beliefs, as did all of my siblings. Cao Dai is universalist in nature. According to a description on CaoDai.org, it recognizes all religions as having “one same divine origin, which is God, or Allah, or the Tao, or the Nothingness,” or pretty much any other deity you could imagine. “You are god, and god is you”—we had this mantra ingrained in us. We were equal-opportunity worshipers, giving every god a shot. Looking back, I see my family’s religion as something of a charm bracelet slung around my wrist, each dangling bauble representing yet another possibility of divine assistance. When troubles came along—and every day, it seemed, they did—I was encouraged to rub those charms in hopes that help would arrive. For years, I prayed to the gods of Cao Dai for healing and peace. But as one prayer after another went unanswered, it became clear that either they were nonexistent or they did not care to lend a hand. And so I continued to bear the crippling weight of anger, bitterness, and resentment toward those who caused my suffering—the searing fire that penetrated my body; the ensuing burn baths; the dry and itchy skin; the inability to sweat, which turned my flesh into an oven in Vietnam’s sweltering heat. I craved relief that never would come. And yet, despite every last external circumstance that threatened to overtake me—mind, body, and soul—the most agonizing pain I suffered during that season of life dwelled in my heart. I was as alone as a person can be. I could not turn to a friend, for nobody wished to befriend me. I was toxic, and everyone knew it. To be near me was to be near hardship. Wise people stayed far away. I was alone, atop a mountain of rage. Why was I made to wear these awful scars? I grew up hearing the proverb “A tree wants to be alone, but the wind always whips it here and there.” That was me: a wind-whipped tree. And I feared I would never stand upright again. In 1982, I found myself crouched inside Saigon’s central library, pulling Vietnamese books of religion off the shelves one by one. The stack in front of me included books on Bahá’í, Buddhism, Hinduism, Islam, and Cao Dai. It also contained a copy of the New Testament. I thumbed through several books before pulling the New Testament into my lap. An hour later, I had picked my way through the Gospels, and at least two themes had become abundantly clear. First, despite all that I had learned through Cao Dai—that there were many gods, that there were many paths to holiness, that the burden of “success” in religion rested atop my own weary, slumped shoulders—Jesus presented himself as the way, the truth, and the life (John 14:6). His entire ministry, it seemed, pointed to one straightforward claim: “I am the way you get to God; there is no other way but me.” Second, this Jesus had suffered in defense of his claim. He had been mocked, tortured, and killed. Why would he endure these things, I wondered, if he were not, in fact, God? I had never been exposed to this side of Jesus—the wounded one, the one who bore scars. I turned over this new information in my mind as a gem in my hand, relishing the light that was cast from all sides. The more I read, the more I came to believe that he really was who he said he was, that he really had done what he said he had done, and that—most important to me—he really would do all that he had promised in his Word. Perhaps he could help me make sense of my pain and at last come to terms with my scars. My salvation experience happened, fittingly enough, on Christmas Eve. It was 1982, and I was attending a special worship service at a small church in Saigon. The pastor spoke about how Christmas is not about the gifts we give to each other, so much as it is about one gift in particular: the gift of Jesus Christ. As I listened to this message, I knew that something was shifting inside me. How desperately I needed peace. How ready I was for love and joy. I had so much hatred in my heart—so much bitterness. I wanted to let go of all my pain. I wanted to pursue life instead of holding fast to fantasies of death. I wanted this Jesus. So when the pastor finished speaking, I stood up, stepped out into the aisle, and made my way to the front of the sanctuary to say yes to Jesus Christ. And there, in a small church in Vietnam, mere miles from the street where my journey had begun amid the chaos of war—on the night before the world would celebrate the birth of the Messiah—I invited Jesus into my heart. When I woke up that Christmas morning, I experienced the kind of healing that can only come from God. I was finally at peace. Nearly half a century has passed since I found myself running—frightened, naked, and in pain—down that road in Vietnam. I will never forget the horrors of that day—the bombs, the fire, the shrieks, the fear. Nor will I forget the years of trial and torment that followed. But when I think about how far I have come—the freedom and peace that comes from faith in Jesus—I realize there is nothing greater or more powerful than the love of our blessed Savior. Today, I thank God for that picture. Today, I thank God for everything—even for that road. Especially for that road. 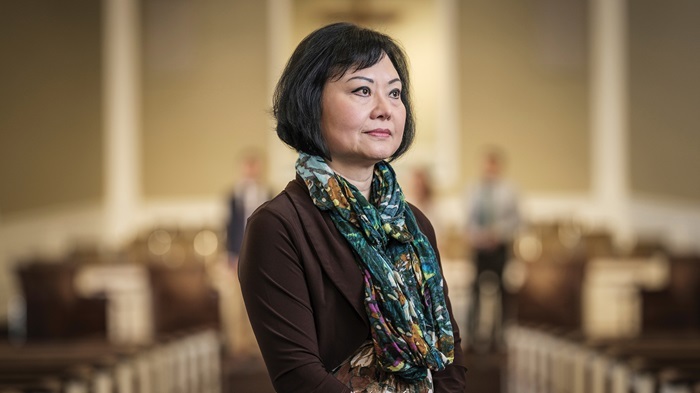 Kim Phuc Phan Thi is the author of Fire Road: The Napalm Girl’s Journey through the Horrors of War to Faith, Forgiveness, and Peace (Tyndale). She is the founder of the Kim Foundation International in Ontario, Canada, and a UNESCO Goodwill ambassador. I’m a Vietnam Vet. I remember her story. Wow, great testimony.